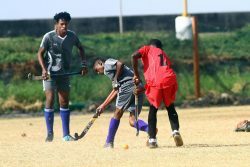 KINGSTON, Jamaica, CMC – Fifteen wickets tumbled but Trinidad and Tobago Red Force emerged with the edge over Jamaica Scorpions, on day two of the fourth round contest between the two bottom-placed teams in the Regional First Class Championship here yesterday. Resuming at Sabina Park on 135 for seven, Red Force were lifted by Yannic Cariah’s top score of 61 as they reached 203 all out in their first innings. Cariah, unbeaten on 22 overnight, struck six fours and a six in an innings lasting 116 balls and just over 2-¾ hours. 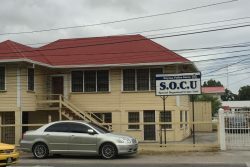 He put on a vital 78 for eighth wicket with Khary Pierre who made 35, and eked 29 out of a ninth wicket stand with Daniel St Clair (nine not out). 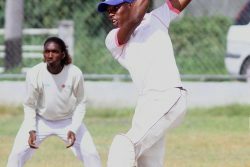 Left-arm spinner Nikita Miller claimed five for 62 while medium pacer Rovman failed to add to his tally, finishing with three for 40. 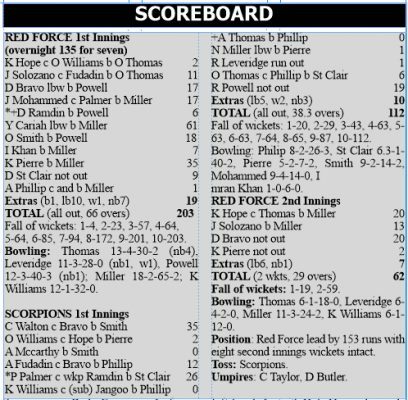 Scorpions batting woes in the competition then continued as they slumped to 112 all out, to concede a lead of 93. Opener Chadwick Walton top-scored with 35 and captain Paul Palmer chipped in with 26 but Assad Fudadin with 12 was the only other batsman in double figures. Fast bowler Anderson Phillip spearheaded Red Force’s attack with three for 26 while fellow pacers Odean Smith (2-14) and Daniel St Clair (2-40), along with left-arm spinner Khary Pierre (2-7) all ended with two wickets each. 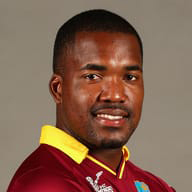 In their second turn at the crease, Red Force reached 62 for two at the close, with Test batsman Darren Bravo unbeaten on 20. In-form left-handed opener Jeremy Solozano fell cheaply for 13, bowled by Miller but Bravo put on 40 for the second wicket with Kyle Hope who made 20 before going caught at the wicket off Miller, about 25 minutes before the close.